Government food guidelines communicate American values in addition to educating us about healthful eating. Comparing the imagery the government uses to communicate its food guidelines shows us how our values have changed overtime and also stayed the same. How do you decide what to eat? First, look at the center. “U.S. Needs Us Strong. 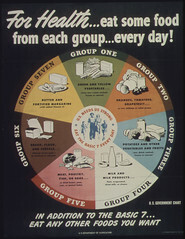 Eat the Basic 7 Every Day.” So, follow the U.S. guidelines out of patriotic duty. Here we can see how patriotism is something highly valued to the point that our government uses it to get us to eat the “Basic 7”. The image suggests that we have the all-American (read White) family with mom, dad, son, and daughter at the center as well. These guidelines are also promising freedom of sorts. Look at the bottom of the poster: “in addition to the basic 7…eat any other foods you want.” Evidently we heard the last part of the message instead of the first part if the obesity rate is any indication (that’s a topic for another day). Now we have five food groups instead of seven. Despite being labeled “choosemyplate.gov,” how much choice is communicated in this image? How does this image mesh with our food options in our daily lives? Calorie for calorie junk food is cheaper than healthy food. What this means is that we can want to eat along the government guidelines all we want, if we can’t afford it, then we can’t do it. This is where structure and agency come into play. Yes, we have a choice in what we eat (our agency), but that choice is constrained by things like our socioeconomic status (social structure). A person could always plant a garden to get lower cost vegetables and fruits in their diet, but if you are an apartment dweller without access to the outdoors, where will you plant your garden? The patriotic duty and image of All-American family is gone from the revised guidelines. Or is it? Yes, there is not an image of a family, but what does the plate symbolize and how does this match reality? Think about it. How often do you eat your whole meal on one plate? If you go the fast food route, there is no plate. If you are in a sit-down restaurant, you do get a plate, but once you have a salad, appetizers, soups, breadsticks, your main course, and a desert you have used several plates and maybe a bowl. And don’t get me started on how dairy is now on the side as a beverage when you actually do need water to survive and you can get calcium-needs met in other ways (like smothering your broccoli or burger with cheese). Also the Association of Spoon Manufacturers is having a hissy fit about the image’s clear pro-fork bias! A plate implies that you are sitting at a table to eat, that you are not rushed, and that money is no concern. We’ve also lost our reference point to the food pyramid. I applaud the U.S. government’ attempt to make learning about healthy food choices a bit easier, but at the same time, most of us will be envisioning the food pyramid for years to come. When we discuss what we should or shouldn’t eat, we think about the food pyramid and we talk about the food pyramid even if we reject the guidelines contained in that pyramid. When we choose what to eat, that choice is shaped by symbols like choosemyplate.gov and by our socioeconomic status. Something as presumably straight-forward as what a balanced diet should look like has real implications in the lives of Americans who can not conform to these guidelines due to socioeconomic status. How has the food guidelines from the U.S. government changed over time? How do you decide what to eat? Do you rely on government guidelines? Why or why not? What do you rely on to decide what to eat? How can you implement the new food guidelines into your life? Are these guidelines realistic for your own life? Why or why not? With a group, brainstorm five meals based on the food plate. Make sure that each meal is unique, but each meal may contain some items from the previous meal (i.e., leftovers). For your homework, find out what each of your meals would cost to prepare and bring the class your answers to our next class. After completing this exercise, do you think that most Americans can afford to eat according to the government guidelines? What could your community do to make it easier to follow the government guidelines?